Anyone feel the Sorting Hat put me in the appropriate house? I, Eaglie, made the Sorting Hat choose Slytherin. It decided I fit in well. 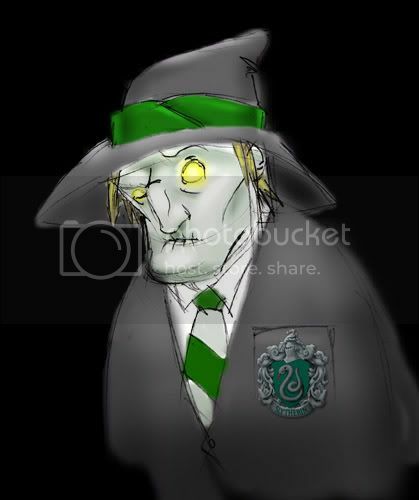 Not all Slytherin wizards are bad! And not all bad wizards are Slytherin! Some come from Romania! Anyway, I could do the obvious thing I do and sort all politicians and celebrities into the houses, but that would just be too... normal of me (they're all Slytherin anyway--see! not funny!). So what should I do? Stall? Well, that got me a line or two. Anway, Slytherin was my choice. I believe there is good in that house, and I feel I can change it by joining plenty of Harry Potter roleplaying communities. I mean, change the evil in the house, not the good. We WANT the good, don't we? My friend Andy is an anomaly. He is a renegade hero at times, a wit and intelligence unto himself, and sometimes just likes to smell the roses. I don't know which house my comrade belongs in: Griffindork? Retardclaw? Hufflepuff (why change it)? So I'll just put him in Slytherin and be done with it. We won't corrupt him too quickly.